Just last year, Amazon Inc. caused a stir when it indicated that it would soon be making drone deliveries to consumers' homes. In December 2015, it released its official prototype designs for the drones it would be using for its "Prime Air" services. As an online retail giant, the brand has been a trailblazer in the industry and set the tone for other companies to follow suit - which is why it may surprise some to learn that Amazon is not the first to make a drone delivery in the United States to a shopper's house. That achievement, instead, goes to 7-Eleven Inc. and Flirtey, TechCrunch reported. In March of this year, Flirtey became the first organization to complete a drone delivery in a residential area within the United States using an unmanned aerial vehicle that was approved by the Federal Aviation Administration. From the software to the packaging, the Nevada-based technology start-up develops its own flying robots and its equipment essentially from scratch, rather than building upon other UAVs. According to TechCrunch, the drone delivery occurred earlier this month in Reno, Nevada; the carrier transported a handful of food and beverage products, including coffee, candy and Slurpees. And while most people tend to consider 7-Eleven a brick-and-mortar retail chain, the company, which has nearly 11,000 stores in North America and almost 60,000 worldwide, does offer its customers online ordering and delivery services via third-party vendors such as Postmates. The source also reported that making drone deliveries is part of 7-Eleven's future plans, though the business's Chief Merchandising Officer Jesus H. Delgado-Jenkins didn't give a specific timeframe for when such services would begin to be available. The problem is that, while drone delivery would be a game-changer for most retail supply chains, the logistics of being able to develop, let alone test and roll out the use of unmanned aerial vehicles for consumer product distribution are clouded with regulatory complexities. And this recent event was an example of how much work goes into being able to make just one safe and legal delivery. "This delivery required special flight planning, risk analysis and detailed flight procedures ensuring residential safety and privacy were equally integrated," Nevada Institute for Autonomous Systems Director of Operations Chris Walach stated in 7-Eleven's announcement. However, Flirtey Chief Executive Officer Matt Sweeny said that this latest delivery signifies "rapid progress" both for the start-up and the industry in general. "When I moved to the U.S. two years ago, only one company had a 333 exemption to do this and that was in the Arctic!" Sweeny said, according to TechCrunch. In the corporate press release, Sweeny indicated that this is just the beginning of Flirtey's partnership with the convenience store titan and that this latest milestone is "is a giant leap toward a not-too-distant future where we are delivering you convenience on demand." As we previously mentioned, last year the FAA and U.S. Transportation Department announced that they were creating a task​ force to handle the registration regulations of unmanned aircraft, a decision that seemed to be driven, in large part, but a spike in the number of cases reported about the hazardous operation of unmanned aircraft systems. According to TechCrunch, by the end of August, the FAA will enforce updated policies on operating UAVs in the U.S. aviation system. Furthermore, earlier this month, both houses passed the FAA Reauthorization Act of 2016 which, in addition to pushing the agency to create regulations specifically for drone distribution services, also requires it to perform research on beyond the visual line of sight flying of drones, also known as BVOS. Moving forward, although incorporating drone and other small aircraft carriers into the supply chain will surely help retailers improve inventory and distribution operations, it might also pose a number of challenges, particularly with safety and tracking. 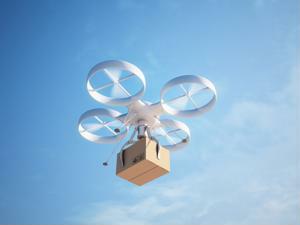 In addition, this trend could cause a shift in supplier relationships, as retail companies that begin using their own aerial delivery systems will not need the services of logistics providers as much.